bmw has taken the top off its just-on-sale 8 series coupe for a convertible version that will arrive in march as peak droptop driving weather gets underway. like the new top-of-the-line coupe, the convertible sits at the top of the heap in status and price and replaces a former 640 model. also like the coupe, the soft-top convertible will launch with a high-end, high-powered m performance version. the 2019 m850i xdrive convertible launch model will start at $122,395 including destination, about 10 large more than the $112,895 starting price for the coupe. mechanically, the convertible, like the launch model of the coupe, will be powered by a 523-horsepower, twin-turbocharged 4.4-liter v-8 with an eight-speed automatic and standard rear-biased all-wheel drive. 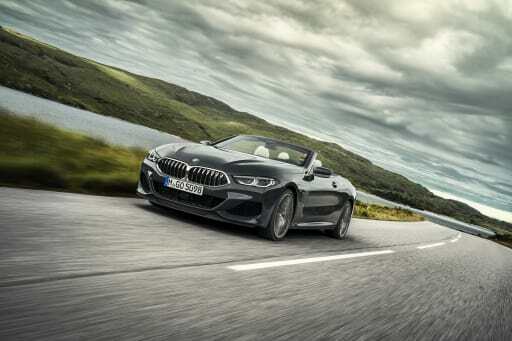 the v-8 puts out a massive 553 pounds-feet of torque, and bmw says that the m850i convertible will push you back in the seat with zero-to-60-mph acceleration of 3.8 seconds (0.2 second slower than the coupe), with a wind-whipped top speed of 155 mph. photos released today show that the new bmw loses some of the smooth and sensual lines of the coupe for a chunkier shape, at least with the taut, insulated fabric top up. and the top has a rounded shape, losing the rear "wings" that were my favorite detail of the soft-top on the 640 convertible. nevertheless, the m850i remains a handsome car, top up or (particularly) down. the "double-bubble" contoured panel behind the head restraints and a portion of the rear deck open to swallow the top for a sleek line with the top down, but the electric top and mechanism still leave some luggage space and the 50/50-split, folding rear seatback opens a pass-through to offer more room. bmw says the top can be raised or lowered in 15 seconds at speeds up to 30 mph. there also is a standard wind deflector that can be fitted behind the front seats to tame turbulence. also standard is active rollover technology that pops up a pair of aluminum roll bars (using an airbag-like charge) if the car senses a rollover is imminent; the bars work with an extra-rigid windshield frame. and an optional luxury is three-speed front-seat neck warmers built into the head restraints for cool weather. standard xdrive and m chassis. the m850i xdrive launch model includes a rear-biased, torque-vectoring all-wheel-drive system. also standard are an electronic locking rear differential, adaptive m sport suspension, active rear-wheel steering and m sport brakes; active roll stabilization is optional. smart transmission. the eight-speed automatic uses data from the navigation system to alter the shifting to suit current driving conditions. two screens, a head-up display and night vision. the convertible has a configurable instrument display on a 12.3-inch screen, and a head-up display also is standard. a 10.25-inch center-dashboard touchscreen handles multimedia and control functions. supplemental control of that screen is via bmw's idrive knob-and-button multimedia controller on the console as well as voice commands. optional is a night vision system that displays on the dash screen people, larger animals and other heat-emitting objects in case you want to know what's roaming your alleys in the dark. squinting headlights. bmw says the led headlights are its slimmest ever, thanks to using its laser-based laserlight technology. leather interior and crystal trim. bmw's merino individual leather is the standard upholstery, not optional as on many lesser bmws. an optional trim package offers a clear glass gear selector, idrive controller, stop-start button and volume control knob for the audio system. the best safety and driver assistance tech is optional: front and rear parking sensors, a 360-degree camera system, and a front collision system with pedestrian and bicyclist alerts are all standard, but an option package can add stop-and-go adaptive cruise control, lane departure warning, lane change warning and lane-keeping assist. digital key. near-field communication technology turns your phone into a virtual key to unlock and start the car. the new convertible moves into a very exclusive neighborhood. its primary rival for open-air luxury fans will be the s-class cabriolet from mercedes-benz and its amg s63 and s65 variants. lexus has shown a concept for a potential lc convertible but has yet to deliver one. before the droptop drops in march, we hope we'll get to see the convertible in person at the 2018 los angeles auto show.